It could be said that understanding what makes the dance floor tick is something that Dave Seaman and John OO Fleming are no strangers to, and this is evident with the dark hypnotic rhythm of their EP’s title track, with psychedelic trance elements brushing alongside the fairly understated tech-house groove. It’s a track that takes the listener on a journey into the evolution of sound; drawing upon the swirling synthesized pads of the late-90s with the clinical production of a present-day release. Offering a slightly more underground contemporary twist on the track is up-and-coming producer Dubspeeka, whose Burial-inspired atmospherics create the soundtrack to a 5am walk home on a cold winter’s night. 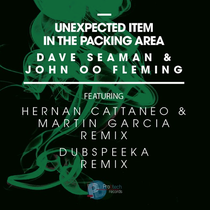 Arguably the more immediate of the two remixes, Hernan Cattaneo and Martin Garcia’s take on ‘Unexpected Item In The Packing Area’ provides a dance-floor moment, and is reminiscent of the work of Get Physical M.A.N.D.Y. Their interpretation of Seaman and Fleming’s track is likely to catapult it to a wider audience. It’s out September 9 on Pro B Tech Records, check it out below.